Do I have to link my own Amazon SES account to use BigMailer? You can use BigMailer email collection forms and import your contacts without connecting to Amazon SES, but you will need to link to your Amazon SES account prior to scheduling a campaign. Do I need to add a credit card to get on a Startup (free) plan? No. As long as you don’t go over the limit of 5,000 contacts you don’t need to add a payment method. You will be charged immediately after selecting your plan and adding your payment information, so make sure to set your limit to be just slightly above the number of customers you have to allow for new sign ups. What if I go over my contacts limit? If you go over the contacts limit you set in any given month you will be owed the pro-rated amount for that month that will be added to your next month’s billing cycle. Got your Amazon SES account out of sandbox mode by requesting a daily send limit increase. You should have a reply within an hour or so. Optional: Define Message Types that your email recipients will be opting out from. If you skip this step, you will have a single “global” (brand-level) unsubscribe for all your campaigns. Think of message types as interest lists and consider specifying frequency, for example “Weekly Newsletter” or “Occasional Product Announcements”. By default, all your list subscribers get assigned into all message types you create. Every time you create a new campaign you will be asked to specify message type, unless you copy an existing campaign (the settings will get copied). Configure your domain name to allow you to use unlimited sender addresses under that domain. With this option, your email header will only have your email address as a sender. Startup plan doesn’t require adding a credit card to an account. When you select a paid plan you will be asked to add a credit card to your account and will be charged immediately, based on the level of contacts you selected. If you go over your selected limit in a given month, your pro-rated difference will be added to your next month’s bill. In order to get a discounted rate, you need to contact us so we may discuss your needs and help you on-board on the platform in the way that unlocks all the benefits. 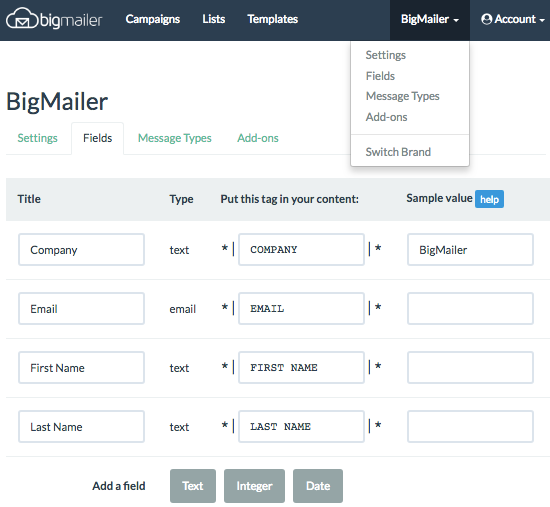 BigMailer Lists can be used in a variety of ways, depending on your business needs. If you are collecting emails from a variety of sources, for example sign up forms on your website’s homepage/articles, member registrations, opt-in on a partner page, or signups during offline events, it might be helpful to define your Lists to mimic your collection sources. You could go very granular (separate blog signups from say homepage) or you could rollup some sources into major groups (on-site, off-site). This will help you see and understand your engagement stats for each of your lists and get to insights on which source maybe producing low-quality or high-quality email lists. While you can segment your campaigns on any of your data points, it maybe beneficial to define lists based on most commonly used criteria like Members vs. Paid Customers, or segment your customers based on product/service they purchased so you can see engagement stats across those major segments on the main Lists view. Using your main segmenting criteria to define your lists can also help you streamline your campaign setup workflow and lower risk of mistakes (sending an email to a larger than intended audience). You could actually combine the two techniques described above, it just slightly complicates the initial setup for email collection. Just make sure to name your lists in a way that prevents confusion as to what they are and represent. Remember, BigMailer doesn’t charge you extra for your contacts to appear on multiple lists, but many market leading ESPs do. In order to create a code snippet for an email collection form to be placed on your website, you need to first create a list the form will be sending the data to. Once you have a list click on the Action button next to the list and select “Manage Forms” option. 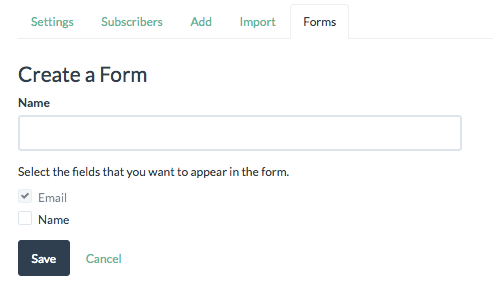 Once on a Manage Forms screen, just click on Create a Form button, name your form and hit Save. NOTE: By default, only the Email field will be listed, unless additional columns have been defined via an import of data into that list or the additional fields/columns were manually defined. This section covers uses cases and suggested methods for collecting emails from your applications. There are various use cases for when you might need to add an email to your lists based on user actions, besides signing up to receive emails from you, for example – registering as a member, becoming a paid customer, signing up for an event, etc. Making a real-time front-end API call in real-time for each transaction. Making a real-time back-end API call in real-time for each transaction. Making a back-end API call on a recurring schedule (hourly, daily). Option #1 is the least preferred method, due to low reliability of front-end calls since you rely on user’s resources (computer/browser) to make the call and it can be interrupted by the user’s action (e.g. closing the browser window or connection interruption) before the call is complete. One of our client’s saw only 30% success rate on such front-end calls, e.g. only 30% of total transactions actually recorded. Option #2 is more reliable than option #1 but not ideal use of your own resources and has some limitations that can be solved for with option #3. Option #3 allows you to send some additional data points, besides email addresses, that can be very useful but may not be readily available when making a real-time call. For example, you may choose to automatically assign a different list to your emails, depending on user status and actions since the initial record creation (for example activating a trial, engaging with a product, becoming a paid subscriber or cancelling within the same day). While you can segment your campaigns on any of your data points, it maybe beneficial to define lists based on most commonly used criteria like Members vs. Paid Customers, or segment your customer based on product/service they purchased so you can see engagement stats across those major segments on the main Lists view. You need to connect your BigMailer account to Amazon SES account before you send your first campaign. You will be prompted through the steps after you register for a new account, but if you choose to skip this setup step you will see an alert at the top of every page about the need to finish your on-boarding along with a link to the step-by-step instructions. We can assist you with setting up your Amazon SES account and connecting it to BigMailer completely for free. Just reach out to us using the chat icon (bottom right) or use our Contact Us form. NOTE: Your Amazon SES account must be out of Sandbox mode to be able to send real campaigns. Your Amazon SES account is automatically taken out of sandbox mode after you send a request to increase your send limit. Most customers get their requests resolved within an hour and unless you requested a specific limit based on your list size, the starting limit is typically 50,000 emails per rolling 24 hour period. If your list is larger than 50,000 contacts be sure to request a limit you require and provide additional info, e.g. links to your site and a page where you collect email addresses. See more detailed info in this article about submitting a request to Amazon. You will be charged additional fee by Amazon for using SES. First 2k emails per day are free, then $0.10 per 1,000 emails. While not required, it is highly recommended that you configure SPF and DKIM to make your emails looks more authentic and to improve deliverability. If you are experiencing a problem where recipients are seeing “sent via amazonses.com” near the “From:” address, setting up DKIM and SPF will resolve the issue. Please see our help pages on SES identities and DKIM and SPF for detailed instructions. 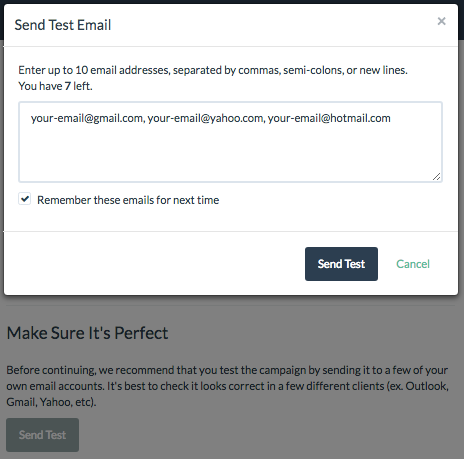 You can send a test email to yourself without scheduling a campaign by listing the email addresses in the field provided on Create/Edit Campaign screen. (Most Common). If you used variables in your email but haven’t specified default values for them in your settings the email sent will have placeholder text where the variable values should appear, e.g. *|NAME|*. This will cause the mailbox provider to identify email as spam and either block the email completely or place it into Spam/Junk folder. To address this, go to Fields under your brand and add sample values to the fields you have defined (see screenshot). Your domain identity configuration isn’t complete. Please see our help pages on SES identities and DKIM and SPF for detailed instructions. Your subject line or email body contains words that increase your email spam score. We suggest to test your email for free with a tool like Glock Apps. BigMailer platform pauses a campaign that reaches a bounce rate of 8% (platform default) to prevent your Amazon SES account from suspension. Amazon recommends a bounce rate below 10% to avoid suspension. You can change the platform limit to be higher or lower in the range of 5-15% for each brand, just click on “Settings” button on the brand list page and expand “Advanced Options” section. If your Amazon SES account gets suspended you should write a message to Amazon explaining what measures you put in place to prevent the issue going forward (for example, removed a bad list) and request account reinstatement. You can use the same steps and form that was used for getting your account out of sandbox mode.